Ok, worked out why it wasn't working, thumbnails weren't being loaded into the imagecache directory. Not sure how to fix that (apart from manually loading them in). Nevermind me, all fixed, thanks for the excellent tutorial. @kaay, Not complicated in the sense that it is near impossible, but complicated enough that a fair few people can't do it easily. When I get some time I will try and write up a multiupload image gallery. I have one question regarding a distance between an images in the gallery. In your example http://gallery.jamestombs.co.uk/gallery I see that images have more space surround. @muzzik, the spacing is down to the theme and browser. The bigger the screen, the wider the theme gets, the bigger the space around the images. 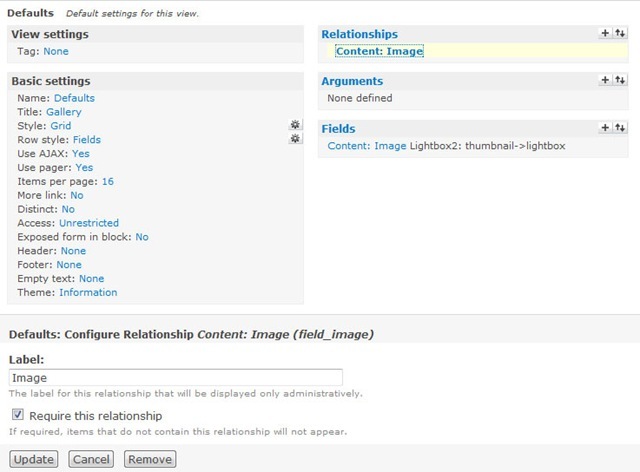 It may be worth posting an issue on the d.o for the Content Permissions Module to see if there are any issues with compatibility with the View modules. I can't get my site to display the images. In the source code it pulls from "sites/default/files/imagecache/lightbox/" which is right (I think) but there is no image there. When uploading it saves the image to "sites/default/files"
Is the imagecache directory writable by the server? Have you looked through the watchdog logs to see if any errors are thrown up? Yes I had all the directories set right - didn't hurt to double check though. Thanks for the info on the logs, Drupal noobie here so hadn't realised they existed. Turns out the issue was with the file names (and spaces in them) but it was the logs that pointed me in the right direction. I followed this tutorial two times, but the images upload but don't show up after i press save. They upload to the sites/default/files folder. What am i missing here. Firstly, thanks for the tutorial. Secondly, I followed the tutorial and also experienced the problem with the thumbnails and images not showing up. After looking at the html that was outputted, I realised that the thumbnail should have been created under sites/default/files/imagecache/thumbnail and the image should have appeared under sites/default/files/imagecache/lightbox - but they weren't - but then, neither were the two folders. I checked permissions - they were fine. I manually created the folders, tried again, and once again, the images weren't created. The one thing that did work for me, was switching to the Private download method under admin/settings/file-system. After adding new images, the new images were now being created in the appropriate folders, and now appearing in the gallery. I'm not entirely sure why the Download method needs to be set to Private, but it now works. I have two question regarding this image gallery making process. 1. Can you make the tagging feature? I know there is image_annotate as well as footnotes but they use the image module for tagging? 2. How can I make number of comments appear beneath the thumbnails? I am very new to Drupal and the only reason I want to use Drupal is to create image galleries. I found your tutorial and followed it step by step, but didn't get a gallery. Let me be more specific. You don't have permission to access /Drupal/Gallery/ on this server. Also, would please be more detailed on how to add images under under /node/add/image. I simply put the images title (of course those images are in the Gallery folder). Same problem as the others. Same problem as the others. Love the lightbox feature, but the gallery is not visible to anonymous users, which is absolutely essential for my site. How do I create multiple galleries. For example, in my site I need to have a different gallery for each performance. I really appreciate all of the hard work that went into creating this module and the time to create the tutorial. @Duc Tran, I think you may need to read up on Drupal a bit more to see how it works. 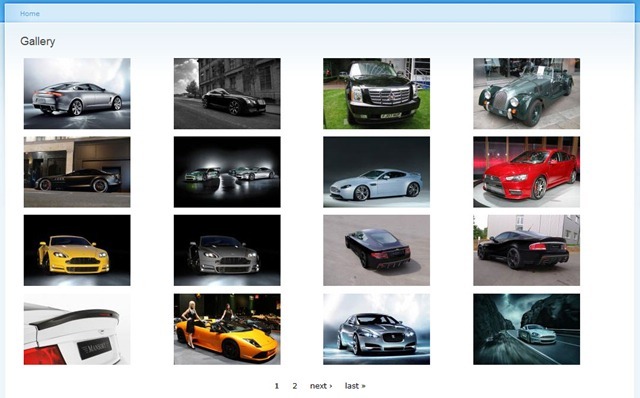 @tim, See the tutorial on Creating an album based image gallery in Drupal 6. There I can see my gallery even though with nothing shown. Now, I need to learn how to add image. Can anyone help please? @Duc Tran, Have you followed all the steps previously? If so, delete the node/add/image folders if you have created them, then navigate to that path in the browser. You can also follow a video tutorial that gets you the same result at learnbythedrop. Yes, I did follow all the steps mentioned. However, I am still not sure if I did it correctly when I tried to add images. I simply put the image titles in the Title field (those images are located in the folder "Drupal/sites/default/files/imagecache/lightbox". @Duc Tran, I take it you are uploading the images through Drupal and not manually placing them in the folder. If you have followed the tutorial the images should be displayed on the gallery page. I did both (uploading & manually placing) but still seeing no image shown. I just went back and checked step by step from the beginning and I didn't miss any step. I even did what the tutorial mentions in the update. @Duc Tran, It may be worth trying what others have suggested and setting your File system within Drupal from public to private. Are you setting this up on a local machine or a web server? Thanks for your help, admin! I am on a web server. I just changed the File system within Drupal from public to private, however the gallery is still blank. @Duc Tran, do you have a link for the site? @Duc Tran, When you go to Administer => Content Management => Content (admin/content/node) are your images set to Published? Yes, their status is published at the beginning. @Duc Tran, I guess it is probably just one erraneous setting which is stopping the images from appearing or possibly a content access module if you have one installed. If you want to set up another user with admin rights to views and content and email the username and password to jtombs@tombscomputers.co.uk I will happily have a look over it for you. Thanks, James! I just deleted everything and plan to start from scratch. If it won't work, I'll let you know. Have a great day! By the way, I have a question. When we create the preset named "lightbox" we "select Add Scale and set the width to 800 and the height to 600". This works well with landscape (horizontal) images. What if we have some portrait (vertical) ones? Also, I noticed that when I opened an album its content images were arranged in 1 column only. How can I make it look like the page /DDrup/albums (rows of 3 or 4 images)? N.B. I just added another album with more than 2 images and some of them are vertical (just to test). @Duc Tran, Try this tutorial for creating a grid of images for each album. As for the vertical images, you can change it to 800x800 if you want to, but you have to remember that some users may have small screen resolutions so you may not want to make it too big. You can play around with those settings until you get it how you want it. Thanks, James! I'll play with the suggested tutorial soon. Finally, I can the albums displayed in rows of 3 images (check this link "http://thetranly.com/DDrup/content/bbsp-april-2009"). However, I would like to change the background from white to black. Would you please help? @Duc Tran, Look in to different themes on drupal.org or Google for some. Alternatively, you can enable the colour module, then go to Themes and configure the colours of the Garland theme. I've colour module enabled, but whatever I tried to reconfig the Garland the colour didn't change. I am reading some docs to see what needs to be done. First off, thanks for the great tutorial. Second, I couldn't get it to load right at first, the same issue some others were having. The images were going to the wrong place. I started over and found my problem was that I loaded my modules in the original modules folder, I had not created on in sites/all. Once I did that, it worked fins. Thanks again! When I tried uploading new Images after the procedure (It worked great ..) , the new images are not being displayed in the lightbox, I can see their thumbnails but when I click on them to open in lightbox, I get an image of a camera with a cross on it ...!! Any suggestions ?? @Sandeep, that will mean that the link to the lightbox image doesn't work. Try changing the view to thumbnail -> Original and see if that works. 1.how can i change space between the images ?what code needed to add to css file ? @hamzah, #1 the spacing between the images will depend on your theme. I suggest you read up on CSS and find out how to do it on your theme. #2 I wrote another tutorial about Creating an album based image gallery in Drupal 6 using CCK and Views which does exactly what you need. Thanks for the great tutorial! I learned a lot. I also experienced the problem with the thumbnails and images not showing up. I found that I enabled the ImageMagick module, but it was not configured on the server. When I changed to ImageAPI GD2 it worked. very nice explanation exactly get the result.